Foodista | Southern Inspired Vegan Fried "Chicken"
Vegan buttermilk fried "chicken" is a meat-free version of this classic Southern dish. Tofu breasts are dipped into a thickened mustard mixture (similar to a beaten egg) before being breaded and fried. Mock meat can be a controversial subject among vegans. Personally, I think that it can be a great transitional food when you are just starting out on this journey. For those totally against eating mock meat, the great take away from this recipe is the technique. 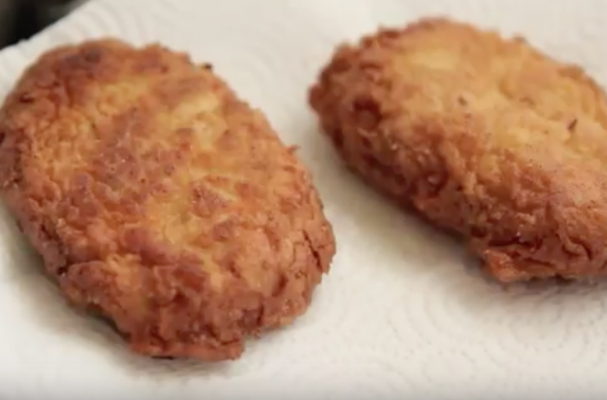 You can make make fried zucchini, eggplant or even tempeh using this method. In keeping with Southern tradition, I would serve this meal with slow cooked collard greens and vegan mac n' cheese.